We'll see just an isolated shower chance Thursday with a little more cloud cover, ahead of our best chance of rain Friday. 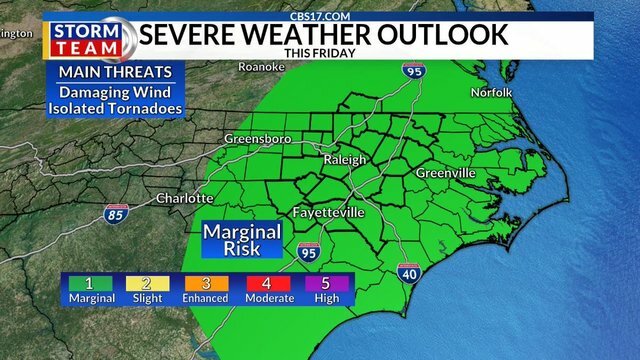 Most of North Carolina was put into the Marginal Risk category of severe weather for Friday. This is a 1 on the 1-5 scale. The storms that move through could bring damaging wind and an isolated tornado. Heavy rain and frequent lightning is also possible Friday. That rain will be out of here in time for the weekend -- a couple of showers could dot the radar on Sunday, but they'll be few and far-between. Another round of warm air will settle in early next week, and it looks like warmer-than-normal temperatures will prevail into the first several days of May as well. A slight shower chance will be with us each afternoon, which is typical for this time of year. Thursday will be partly sunny, with an isolated shower possible. The high will be 83, after a morning low of 59. The rain chance will be 20 percent north of the Triangle. Friday will be mostly cloudy, with scattered showers and a few storms. The high will be 75, after a morning low of 63. The rain chance will be 80 percent. Saturday will be mostly sunny. The high will be 74, after a morning low of 52. Sunday will be partly sunny with a slight shower chance. The high will be 79, after a morning low of 52. The rain chance will be 20 percent. Monday will be partly sunny, with an outside chance of a stray shower. The high will be 78, after a morning low of 56. The rain chance will be 20 percent. Tuesday will be partly sunny, with another slight chance of a shower. The high will be 80, after a morning low of 58. The rain chance will be 20 percent. 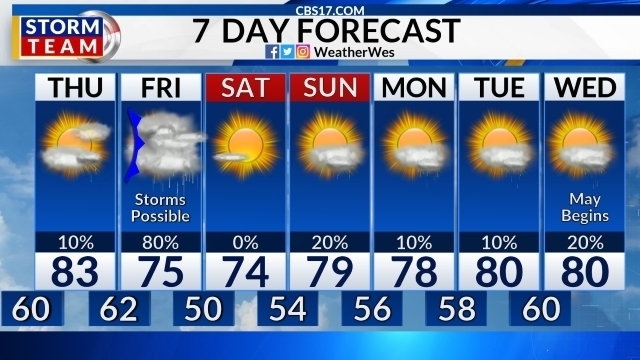 This forecast was prepared by the CBS 17 Storm Team and is based on the latest information available and years of weather forecasting in North Carolina. It was not produced by a computer like many forecasts you find on the web, social media and smart phone apps.